I have a coworker who often posts pictures of mouth-watering foods he and/or his wife invent–exotic fusions of different cuisines and styles. I’m no foodie, but I can respect the creativity and effort involved. So much so, that I ended up discussing it with my teens. And for some reason, it struck me that we could combine two family favorites into one (potentially) amazing meal: curry pizza. The problem: My 9 year old hates curry. My 4 year old will eat it so long as it’s not spicy. And my wife gets sick of pizza all the time. So there was great potential for disappointment here. My first attempt had some flaws, but the family loved it so much I had to make it again two days later. A friend also requested pics and a recipe. So this time, I got things right and snapped a few pics along the way. 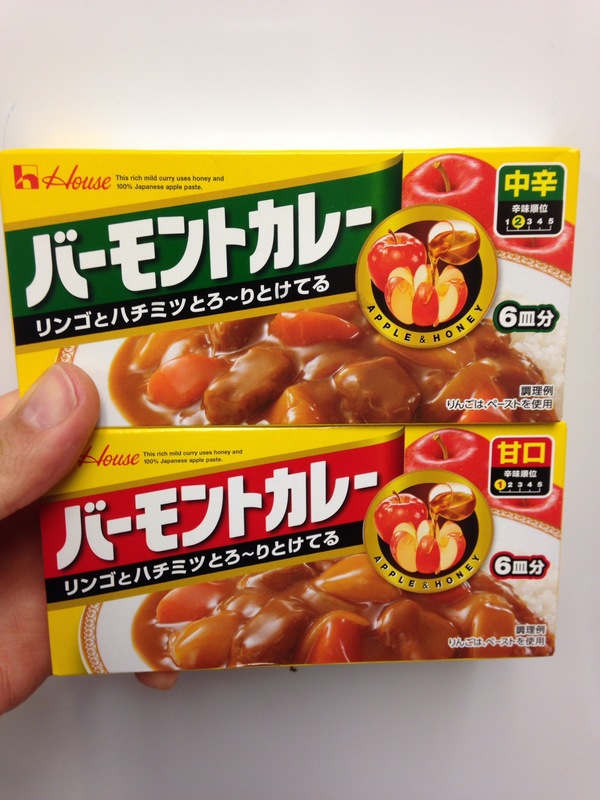 I love this kind of curry mix because of the touch of sweet provided by the apples and honey. I’ve seen it labeled as Vermont Curry in the states. Lean ground beef, browned and drained, with a little added curry powder, but I imagine some chopped chicken or perhaps some bacon bits would work quite well. 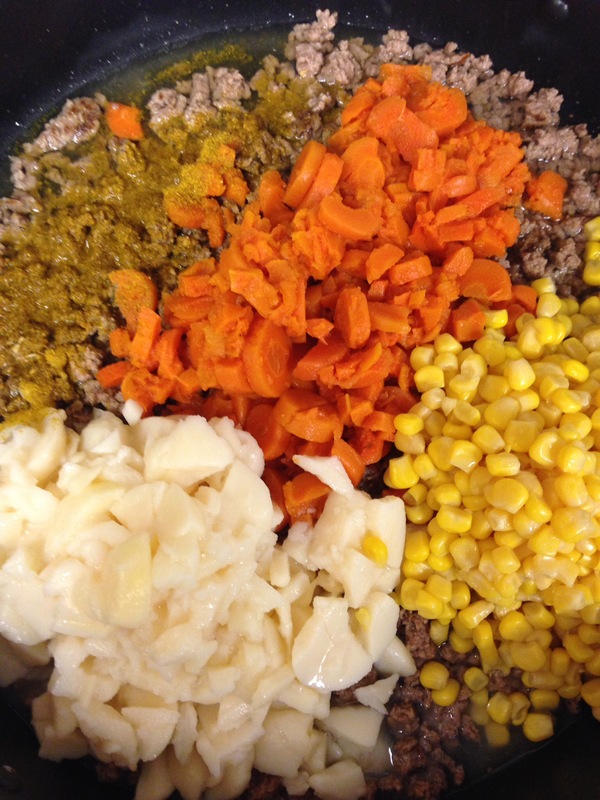 I like some potatoes, carrots, and corn in the mix, but the add-ins are certainly flexible. This time, I chopped them up a bit so I’d have less large chunks on the pizza. My first attempt had too much beef and veggies for the amount of sauce, so it felt like spreading a casserole across the pizza crust. Not good. This time I used 1 pound of beef plus a can of each of the veggies with the two packs of curry mix, and that worked out far better. Yes, canned foods, probably made with 100% pure Monsanto goodness. You can really taste the soylent green! Almost looks like a breadbowl of a sort… but that’s a pretty thin layer of curry. It seems odd to me that this should be considered a recipe. It’s really just a blog post. 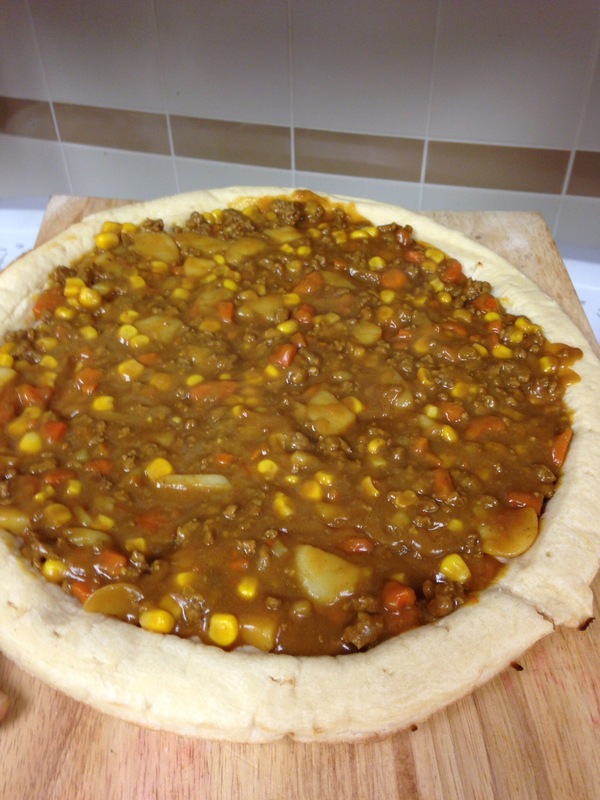 Once the curry sauce thickens, slather it across a pizza crust. My original idea was to use some naan bread, but I couldn’t find any at the nearby store and was too lazy to drive to any of the local Indian restaurants or CoCo’s curry houses. Sprinkle with shredded cheese of your choice–mozzarella and provolone being my favorite–then bake for about 10 minutes until the cheese and crust are starting to brown. 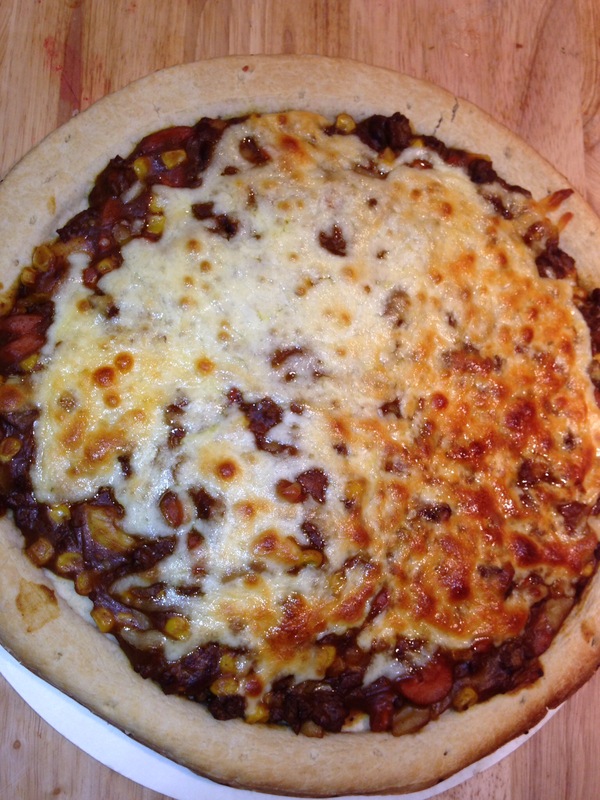 The pile of saucy meaty ingredients put a strain on the crust, so getting it a bit crisp on the bottom helped support the added weight and moisture of the toppings. Honestly, I haven’t tried naan bread yet, and my fear is that it might not hold up a layer of curry and cheese as well as the crusts did. Depending on your eaters’ preferences, sprinkling some minced garlic on top of the cheese before baking can give the curry pizza a tasty added kick. If you do give it a shot, I’d love to hear your thoughts.